Traditionally manufactured extruded hose can vary in thickness, becoming bulky and heavy. 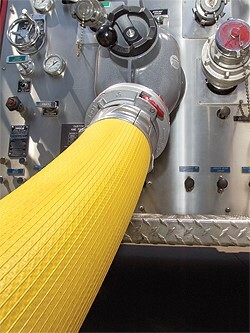 Snap-tite Hose TPX utilizes a 3-ply design where the ribbed cover and smooth nitrile liner are extruded independently. The cover is inserted inside the tight-weave reinforcement, vulcanized, then turned “inside-out”. The liner is then inserted and the hose is vulcanized for a second time to form a bond of all three plies, guaranteeing a consistent, compact hose wall. This 3-ply design allows us to weave the polyester reinforcement tighter, making this hose more resistant to puncture while also being easier to pack and store. TPX needs less hose bed space than typical extruded hose and is lighter weight for easier mobility. When higher pressure LDH is required for attack applications, please refer to our ATX hose. 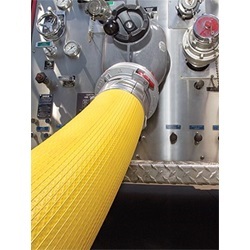 TPX is a 3-ply nitrile rubber municipal fire hose with both the cover and liner made independently along with high tensile strength polyester reinforcement for maximum durability and flexibility. Smooth liner keeps friction loss to a minimum and is the best-in-kind, surpassed only by Ponn Conquest. Nitrile rubber cover greatly increases abrasion resistance, provides long service life and the tightly woven reinforcement resists puncture. Hose remains flexible to temperatures as low as -5°F (-20°C) and is resistant to ozone, oxidation, and most chemicals or petroleum products. Suitable for attack, supply, and suction applications. Snap-tite Hose TPX is manufactured in accordance with NFPA 1961 standard, latest edition within our ISO-9001: 2000 certified quality assurance system. A Lifetime Guarantee against Delamination.